I broke down, paid for one of those DNA ancestry tests, received the package, spat in the tube, mailed it back, waited for weeks, and finally learned that i’m 100% European. What!!! Not the tiniest taste of something lactose intolerant? How boring. Thanksgiving is near. It’s my favorite holiday because even though Norman Rockwell famously depicted the whole family praying at the table around a huge roast turkey, it’s a completely secular holiday, one that can be celebrated by anyone of any religious affiliation or none. Perhaps it’s darkness falling earlier and earlier this time of year that helps put us in reflective moods, or maybe it’s just a pent up need to express some gratitude for our good fortune, the best way being to lend a helping hand to those in need. I’ve just done that, flying off to Albuquerque to visit my dear old friend Charmazel. We met in September, 1966, when we both matriculated at Texas Tech for postgraduate study, and we instantly clicked. So much so that the friendship continued for the next 52 years as i ended up retired in San Francisco and she in Albuquerque. Alas, in recent years her diabetes has impacted her vision, to the point that a few months ago she became completely blind, so she listens to audio books and has learned to use a cane. Fortunately, her retirement home includes a restaurant that’s really quite good, so she doesn’t need to cook. Even though the blindness was decades coming and she had plenty of time to get used to the idea, when the lights finally went out, she became a bit despondent. We talked fairly often, but i gradually felt that that wasn’t enough and decided that i’d pay her a visit. I no longer travel well, to put it mildly. My previous flight, the first in 9 years, ended up costing me a fractured vertebra that took three difficult months to heal, but other than that, the trip went well. So surely a nonstop flight to Albuquerque and a rental car to get us around would be doable. Well yes, sort of. I got lost on the way from the airport to her place, but i finally found her. The reunion was joyous, and while we’d been talking on the phone a good deal, somehow being face-to-face was much better, particularly for me since i can still see. The assortment of her favorite jams, marmalades, and pickles survived the trip, which gave me a sense of accomplishment, and we got to spend three days eating and schmoozing to our hearts’ content. It was an excellent visit even though i got lost again trying to get back to her place from an Indian restaurant. And then, on my way back to the airport for my return flight, i got lost for the third time, which helped me understand that i should not travel out of state anymore even for a reunion as wonderful as this one, particularly since i could have saved myself all the anxiety and hassle by simply bringing a map. I’m done. 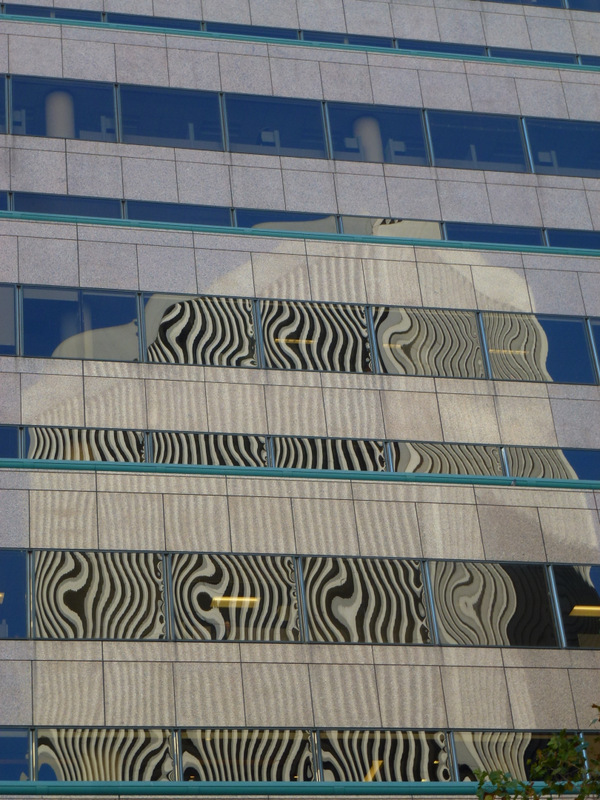 Meanwhile, since i didn’t take a single damn photo in Albuquerque, here’s a moiré effect i spotted on Market Street the other day.